I’m so excited to tell you about my new book! It doesn’t arrive in stores until June 6, but I thought I would record a short video to tell you about it now. Click here to receive the opening chapter of That’s Gotta Hurt: The Injuries That Changed Sports Forever absolutely free right now! As I mention in the video, I would love some help from people willing to help me promote the book. This book has information that can help not just athletes, but also anyone who plays sports or exercises. That’s one reason I am so excited to spread the message. If you’re interested in helping me, touch base with me by sending me a short message here. 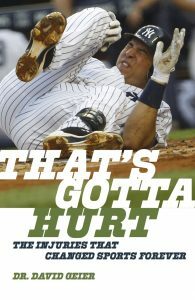 Make sure to get the opening chapter of That’s Gotta Hurt: The Injuries That Changed Sports Forever right now for free! Click here! Will the changes made by USA Football make the sport safer or relieve parents’ concerns?